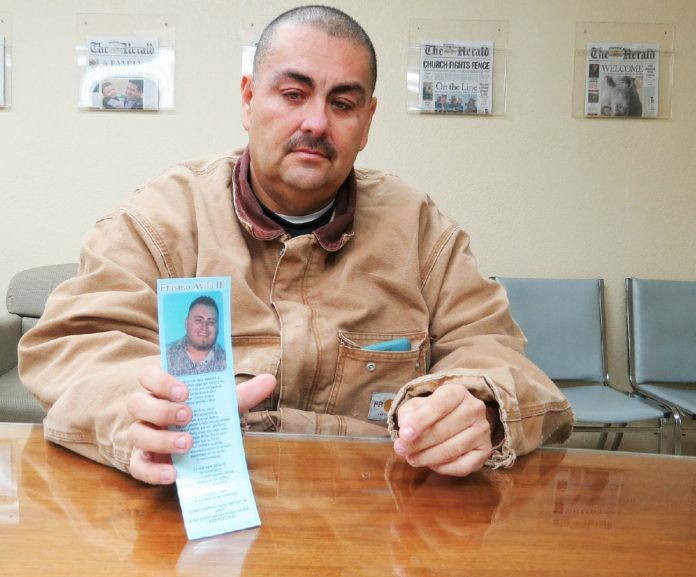 Mark Reagan | The Brownsville Herald Speaking to The Brownsville Herald, Erasmo Avila holds a photo of his son, Erasmo Avila III, who died March 6, 2016, near the 1900 block of Old Port Isabel Road in Brownsville. For the past two years, the holidays just haven’t been the same for Erasmo Avila and his family. Times that should be full of joy — Thanksgiving and Christmas — are instead painful. They have been since March 6, 2016, when his son — 21-year-old Erasmo Avila III — died in an early morning crash. According to court hearings and records, Erasmo Avila III was the passenger in an orange 2010 Chevrolet Camaro driven by his friend, then-19-year-old Arturo Vasquez, when Vasquez, who was driving at a high rate of speed, lost control of the vehicle and crashed into a tree between 2 and 2:30 a.m. on the 1900 block of Old Port Isabel Road. Erasmo Avila III died at the scene and first responders extracted a seriously injured Vasquez from the vehicle and transported him to Valley Baptist Medical Center. When Vasquez was medically cleared, the Brownsville Police Department charged him with intoxication manslaughter and the Cameron County District Attorney’s Office later indicted him. Vasquez, now 21, pleaded guilty and, on Nov. 3, 2017, was sentenced to a decade in prison. Court records paint a tragic picture of the crash. According to police records, a Brownsville Independent School District police officer saw the Camaro driven by Vasquez and a black pickup traveling at high rates of speed and attempted to catch both vehicles, but the officer saw Vasquez driving against traffic near Hackberry Lane and activated emergency lights to warn motorists of the danger. That officer witnessed Vasquez lose control of the Camaro, hit a tree and catch fire. The officer who extracted Vasquez from the vehicle reported smelling alcohol and believed he was “heavily intoxicated,” according to records. Court records indicate that both Vasquez and Erasmo Avila III were at a bar earlier that night and before the crash, the Brownsville Police Department were investigating reports of shots being fired. According to police reports filed in the case, authorities found the victim with “what appeared to be a AK-47 rifle in his left arm” and also found casings and rifle cartridges in the vehicle, but there was no evidence that gunfire hit the Camaro. While the case seemed closed, allowing the grieving father to move on with his life, all of that changed on May 2, 2018. Less than six months after Vasquez was sentenced to prison, 357th state District Judge Juan A. Magallanes granted what is called shock probation, which is when a judge sentences a defendant to prison and then returns them and sentences them to community supervision. For Erasmo Avila, instead of healing, the wound caused by the death of his son re-opened. As for Vasquez, who had a shot at freedom, court documents indicate he skipped 11 alcohol breath tests between June 15 and July 14. He also tested positive for alcohol on several occasions, including July 7 and Sept. 10, and just over a month ago he tested positive for cocaine and admitted to using the drug on two occasions, records show. Ten days later, the Cameron County District Attorney’s Office filed a motion asking Magallanes to revoke Vasquez’s community supervision. The whole episode disillusioned Erasmo Avila. “I want people here in Brownsville to know how we have a court system that is not working,” he said. He felt that Vasquez should never have been let out of prison and said he has spent weeks waiting to see if Vasquez would go back to jail, saying he has had trouble sleeping at night and has been sad. “This is something I wouldn’t wish on anyone. I told the judge we already lost someone. I don’t want to lose anyone else,” Erasmo Avila said. On a chilly rainy morning on the day before Thanksgiving, a day of reckoning came for Vasquez as he again appeared before Magallanes with his defense attorney, Noe Garza. Erasmo Avila was dutifully in the courtroom, as he has been throughout the proceedings, as well as Vasquez’s family. Vasquez’s attorney, Garza, told Magallanes during the hearing that it’s clear his client has a drug and alcohol problem and said that a lengthy sentence wouldn’t serve anyone because when Vasquez is released from prison, he will continue to drink and use drugs. “It is clear to me that he has a problem with the use of alcohol and now progressing with the use of drugs,” Garza said, describing his substance use as a relapse. Garza asked Magallanes to sentence Vasquez to a substance abuse program instead of sending him to prison. Assistant District Attorney Art Teniente, however, told Magallanes that Vasquez was granted a luxury in receiving shock probation and reminded the judge at the time community supervision was granted, Magallanes told Vasquez that even the minutest slip-up on his part would result in him serving the full 10 years he was previously sentenced to. Magallanes told Vasquez he hoped a few months in prison would shock him into good behavior, but, the judge said, it’s clear that it didn’t work. Magallanes said he handed down the decade-long sentence with great sadness. But for Erasmo Avila, it was justice, which is what he said he has wanted for his son all along. Staff online editor Diana Maldonado contributed to this report.